First I have to say I am a "taking notes-test colour" addict. 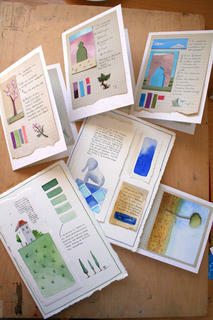 I had to make a few cards for a local store that sells handmade artists items and had completely blanked out of ideas. Going through my notes, thinking "this is hopeless", I thought I'd might as well leave it for the day. After a cup of tea, and talking it over with the olive tree on my veranda, everything started making sense: I could make my notes into cards. I have loads of them, just sitting there...why not? I love these cards Maya, the colours are great. The blog's looking good too, I've also just started and am finding it difficult to think what to put up . . . too much thinking I guess . . . must do more doing! I am new to this bloging thingy too, but am steadily getting attached to it. I will pop over to have a look at your blog...Im sure you've got a lot more things then I have...haha. Would you mind If I add you to my links? And are these wonderful cards going to be available for sale to the rest of the world, or is it just for the lucky people in Cyprus??? Thank you , for thr lovely comments! I think world supply would seem like a nightmare at the moment, nowhere near enough notes and samples,lol! ummm....btw, may I add your blog to my links?? I really love these cards! So artistic!